Blowers are powerful machines that provide variable speeds of concentrated air to clean up surfaces that end up with debris after mowing. 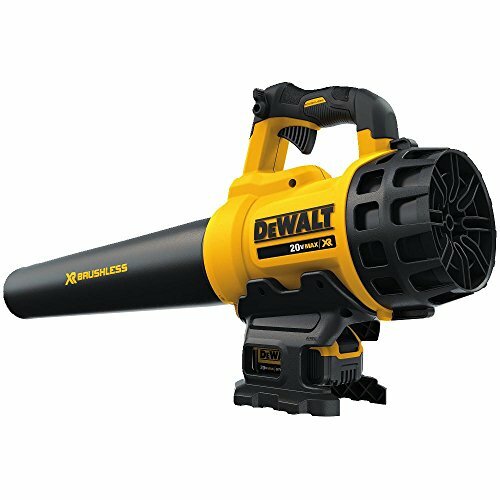 Once such blower is the DEWALT DCBL720P1 Lithium Ion Brushless Blower which eliminates the need to use a rake or broom to keep your backyard or patio free of leaves and light debris. With a blowing capacity of 400CFM and 90MPH, blowing leaves and other light debris has never been easier. DeWalt is a well-known, reputable and highly trusted manufacturer of a range of different power tools, lawn and garden appliances, as well as accessories. They are known for making top of the line, durable, well made products that withstand the test of time and can handle heavy duty projects and regular use. Having been around since 1924, the company has proven that is capable of successfully providing quality outdoor tools that customers want to purchase again and again. This absolutely includes blowers such as the DCBL720P1, which is a great machine if you are looking for a lot of power without a lot of added weight. The DCBL720P1 Lithium Ion XR Brushless Blower is a powerful, heavy duty blower that can handle pretty much any project whether it's a simple clean up in your shop or the daunting task of getting all the dead leaves off your lawn or driveway. Typically, these kinds of jobs can take a long time and lead to discomfort and soreness. However, with a quality blower to help handle the task, you won't have to worry about that. At around $175, this is an excellent value for a durable, finely machined tool. It comes with a long-lasting battery so that you have plenty of time to take care of your clean-up before having to charge it again. The small, easy to use design of this blower will be sure to make your chores a lot simpler and possibly even a little more fun. The blower features a brushless ﻿﻿﻿﻿﻿﻿﻿﻿﻿﻿motor, which helps to make the motor more durable and resistant to malfunctioning. Not only does this make the motor work better, it also makes it work more efficiently as well. It features an axial fan design, which helps to maximize the machine's air output as well as running time per charge. This is an electric blower and therefore doesn't emit any offensive stinky fumes. Another great aspect of this blower is that it is cordless. You won't need to deal with dragging around a cord or making sure that it stays plugged in. It simply requires a well-charged battery and it will be good to go! The 20v Max blower is an incredibly lightweight machine, coming in at only around 7.1lbs. Because it is so light, it's a lot easier on the user. Nobody wants to be lugging around a heavy piece of machinery whether it's for a few minutes or hours if your job includes cleaning up a lot of leaves and other debris. The easier the machine is on your body, the less of a hassle your tasks will be.The effective lightweight design of this device is going to save you a lot of time and effort that you might otherwise spend doing backbreaking work with a shovel, rake, or other manual tools. When the work is that much of a pain to do, a lot of the time it can seem more appealing to just put it off. Unfortunately, that just leads to more work piling up. With this blower, you won't have to worry about straining yourself lugging around heavy equipment or having to put a lot of effort into whatever debris it is you need to get rid of. It will make the job quick and easy, meaning you don't have to put it off. The blower can reach a top air speed of 90 MPH, making it suitable for most projects, from typical leaves, to dirt, grass, and other debris. It's an incredibly effective tool at that speed, allowing it to clear spaces of up to 400 cubic feet in only a minute. That's a lot of power for such a small device! With this kind of capability, it's likely to only take minutes to clear your driveway or lawn of those annoying fall leaves. With all that power, one might expect this blower to be a rather loud piece of equipment, but it actually runs rather quietly. This in itself is a wonderful quality in a blower because it allows you to get your job done without having to worry about dealing with high volume machine noises the entire time you work. You can also feel free to get your work done early in the morning while your neighbors are still sleeping peacefully without disturbing them with the sounds. That's especially great in the summer time when you want to get your tasks out of the way before the heat sets in. It has a variable speed trigger that allows you to easily adjust the speed, as well as a locking mechanism that makes sure it stays at the desired speed setting. This way, you don't have to worry about accidentally changing the speed as you work. It will remain exactly where you need it until you are ready to change the speed or the job is completed. One advantage with these types of tools, is that once you have the battery and charger, you can use the same battery and charger on other tools from the same range. For instance, you may have the DeWalt 20 Volt Weed Eater in which case you can utilize the same battery and vice versa. It is durably built and well-constructed. It features ergonomic design features to make it easier to use, grip, and wield with ease.The blower comes with a charger included. That way you won't have to worry about spending more money to be able to charge your machine. The setup also comes with a 3 year limited warranty, helping to make sure that you are completely happy with your blower. Overall, this blower has received glowing reviews by those who have purchased and tried it out. You can see some of those reviews here. Customers particularly enjoy the long-lasting ability of the battery, saying that in some cases it is able to outlast even their larger blowers with higher voltage batteries. It's always great to know that you're likely to finish your job before the battery needs to be recharged again. People have also liked the style of the tube on this blower, saying that the bigger, longer design allows them to reach a higher level of coverage than with other blowers. Both of these are really great benefits, because they allow you to use a smaller tool for a larger task, creating a higher level of efficiency. One thing to keep in mind with this blower is that customers have also mentioned that on occasion the battery has suddenly stopped holding a charge. Luckily, this is a small issue with only the battery and doesn't reflect the abilities of the blower itself. With the use of the 3 year warranty, this is a problem that will likely be met with an easy solution. DeWalt customer service is sure to take care of you and address any problems or concerns that may come up regarding this blower. If you think that you may need something much more powerful, you can find our review of the Husqvarna 360BT backpack blower here. Yard work is not most people's idea of a good time, but we all appreciate the aesthetic pleasure of a clean and tidy lawn and surrounding surfaces. This is why there has been such an explosion in the availability of time saving appliances and tools that allow us to have that clean and tidy yard, but that don't require us to spend hours upon hours keeping it that way. One of the most useful and under-appreciated tools for this type of project is the brushless blower. A brushless blower is a highly efficient and durable lawn and garden tool that makes it easier than ever before to clean up debris and keep your yard, sidewalk, driveway, patio, etc., tidy and clean, even right after yard work. There are a few decisions that you will need to make before you even start to look at potential models in order to ensure that you get the blower that will meet your needs and budget. Of course, you will need to consider price. You will also have to determine whether or not you want a corded or a cordless blower. They both have their advantages and disadvantages, but the portability of the cordless blower is why we choose to focus exclusively on this style here. If you choose a cordless blower, you will have to decide whether you want a gas or electric powered model. Gas has the advantage in that you get the most run time as well as portability, but electric models are quieter, lighter, and don't emit any noxious fumes. Hookaroon or Pickaroon, Which Is Best For You? thetoolboss.com is a participant in the Amazon Services LLC Associates Program, an affiliate advertising program designed to provide a means for sites to earn advertising fees by advertising and linking to Amazon.com. You will not pay any more because of this, in many cases, you could actually pay less as we hunt down the best prices and discounts for you. Copyright text 2019 by The Tool Boss.